According to information found at this web site, plans for a national monument to honor founding father George Washington date back to the year 1783. If you are interested in learning about the Washington Monument, then access the information found at the National Register of Historic Places web site. Read about the plans for creating a structure to honor Washington and details about the monument itself. Use the provided links to learn about the Washington Monument restoration project and other web sites with information about this national symbol. The legend of the Swamp Fox involves the Revolutionary officer from South Carolina named Francis Marion. This article explains how Marion earned the nickname Swamp Fox by fighting the British with a band of fighters in the swamps of North Carolina. This practice also gave him the title of the Father of Guerilla Warfare as well. Marion's experience in the French and Indian war is described along with his band of irregulars, and his role in helping Washington replace Horatio Gates. His popularity is revealed in descriptions of many honors he received following the Revolutionary War. This is the official web page of the American Battle Monuments Commission. In 1923, this Commission was formed to honor the men and women in the American Armed Forces. 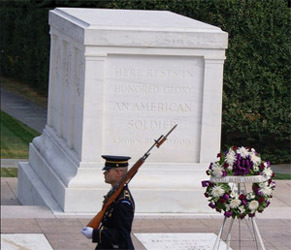 By visiting this web page, you can learn about all the different memorials located throughout the world. You can also learn about American burial grounds located throughout the world. If you are interested in visiting any of these sites, information is provided, as well as information on commemorative events. If you are learning about the Japanese attack on Pearl Harbor, the event that caused the U.S. to enter World War II, you will need to know facts about the USS Arizona. The USS Arizona was bombed and destroyed in the attack, and several crewmen lost their lives. Find out the statistics and the details about the bombing of the Arizona and how the USS Arizona Memorial came to be. Since the Arizona could not be salvaged, it was decided that a memorial should be constructed to honor all those who died in the Pearl Harbor attack. "No individual has any right to come into the world and go out of it without leaving behind him distinct and legitimate reasons for having passed through it." Very few people in history have the honor of being commemorated on a U.S. stamp. John Fremont was one of those to receive the honor, gracing the face of the 5 cent stamp in 1898. Readers will learn about the life of John Fremont and his contribution to exploration and politics. Readers will also learn about the history of his first stamp, as well as two additional Fremont stamps, one that was printed in 1994 and the 1998 reissue of his original stamp. The "New Colossus": written by Emma Lazarus in 1883. Proceeds that were raised from its auction were used to complete the pedestal of the Statue of Liberty. This plaque memorialized the sonnet in 1903 and was placed on the inner walls of the Statue's pedestal. It currently is displayed in the Statue of Liberty exhibit. The original handwritten sonnet is housed by the American Jewish Historical Society. The air-bidged harbor that twin-cities frame. At 5 p.m. July 3 the 2nd Battalion 1st Vermont Cavalry led by Major William Wells, General Farnsworth commanding the brigade riding by his side crossed Plum Run near this point charging over stone walls amid rocks and through woods till they encountered five regiments of Law's Confederate Brigade near the spot where the regimental monument stands. The 1st Battalion and part of the 3rd Lt. Col. A.W. Preston commanding were ordered to the support of the 2nd moved northerly to the Slyder house turned into the lane and struck Law's Brigade in the flank the onset was terrific sabres and bayonets revolvers and muskets being freely used after a struggle the hill was carried by the 1st Vermont and the prisoners captured sent to the rear. This memorial signalizes the valor of the officers and the men of the First Vermont Cavalry who here paid to the nation the uttermost tribute of devotion." The Ernest Shackleton Museum is dedicated to the life and discoveries of explorer, Ernest Shackleton. The opening page tells you the story of Shackleton's expedition to the South Pole and leaves out no detail. Excerpts from articles and news associated with Shackleton are presented as well. This page is where you can also learn about the museum itself, read the news related articles in their entirety, browse a photo gallery, and access the museum's complete archives. The magnificent Statue of Liberty is not only one of America's most recognized national monuments but also a symbol of her ideals; freedom, democracy and international friendship. The statue, that was a gift from France to America on her hundredth birthday, arrived in three hundred fifty pieces. Find out more about the history of the Statue of Liberty and Ellis Island, and take a look at the photos. This site created by the national Park Service provides information for visitors about park tours, services, and museum exhibits. Eight million horses died during World War I. Thousands of pigeons were sent into enemy territory in World War II, and few returned. Dogs continue to be used to search for mines and survivors. Animals served and died alongside humans in wars. Learn about dogs and pigeons that continued their life-saving work in spite of injuries, and horses that faced their fear of bombs and fire. Mules had their vocal cords cut so that they could deliver supplies noiselessly in the jungle. The Center of Military History for the United States Army presents this valuable Web site on the Medal of Honor. Since 1861, more than 3,400 Medals of Honor have been awarded to Unites States Soldiers, Sailors, Airmen, Marines, and Coast Guardsmen for acts of bravery and service for their country. This Online archive provides the names of the recipients for each war. A few wars listed in this archive include: Civil War, Indian War Campaigns, War with Spain, World War I, World War II, and Korean War.